Are you sick of it yet? Let me help. It’s perfectly fine to treat asparagus like a delicate flower, seasoning with just a splash of olive oil and lemon juice and maybe some herbs – but just a skosh. It’s lovely. I do it often. 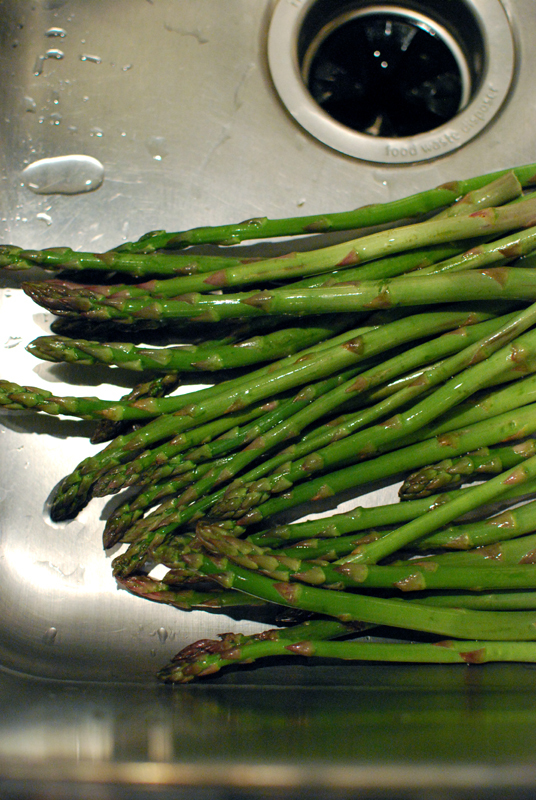 But man, asparagus can stand up to some flavor. It reminds me of that other Spring delicacy, crawfish. The French treat them with care, preserving the mild flavor by cooking with care and saucing gently. The Cajuns, on the other hand, boil the crap out of them with spice measured in cups and gallons, not teaspoons. I’m from New Orleans. It’s clear what crawfish camp I’m in. Of course I’m going to use the same spice-theory with asparagus. Don’t be afraid to get a little saucy with your asparagus. 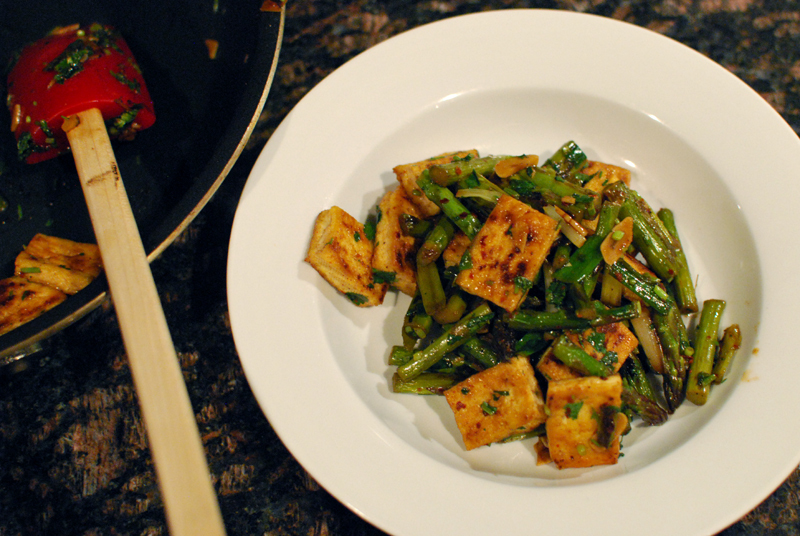 Stir-fry it with tofu, garlic, scallions, and fish sauce. Char it. Pitch in some exotic red pepper. Punch your refined palate in its little face. If you miss the more subdued flavor of lightly-handled asparagus, I assure you there is a restaurant nearby serving a perfectly lovely side of roasted asparagus. Me? I’m going for the stir-fry. 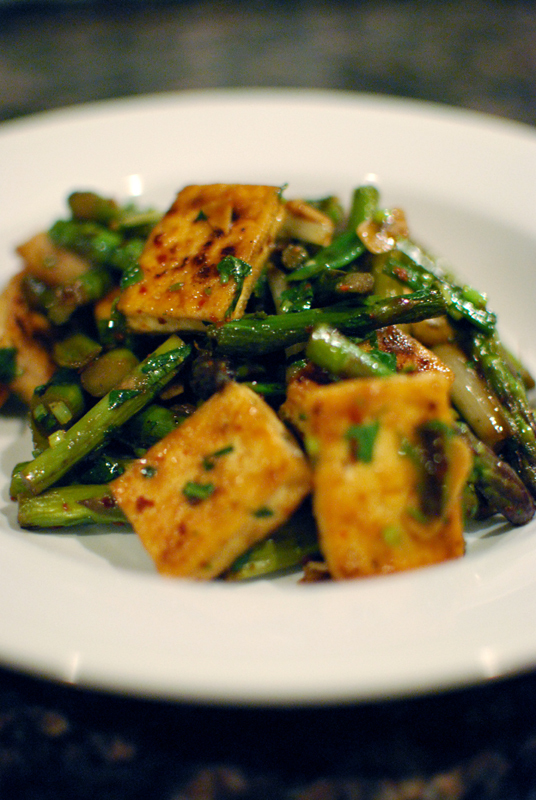 For tofu that will soak up more flavorful sauce, try freezing it solid before thawing and using as directed. The water in the tofu will expand as it freezes, creating an open structure in the texture of the tofu. 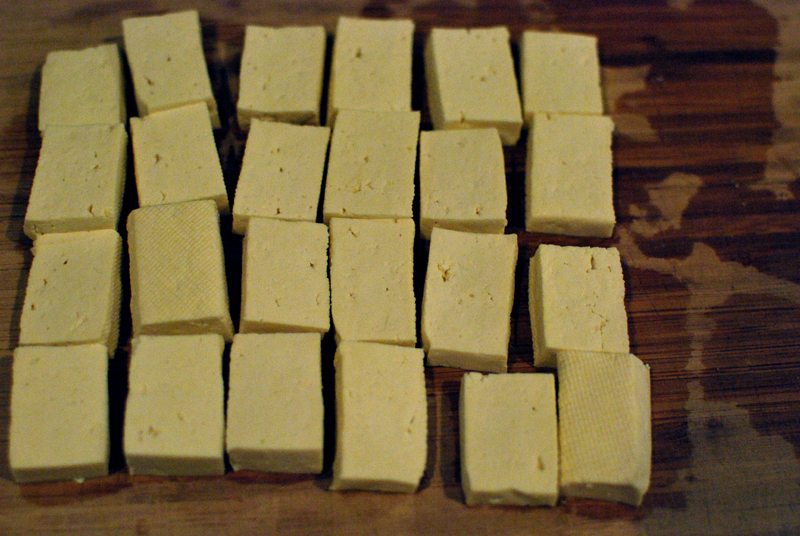 When thawed, the tofu will act like a sponge, soaking up more liquid than it would otherwise. It will also have a "meatier" texture. Science! You can substitute 1/4 teaspoon crushed red pepper flakes (or more) for the gochugaru, which I understand not everyone has sitting around. 1. Prepare all ingredients before starting. I mean it. 2. 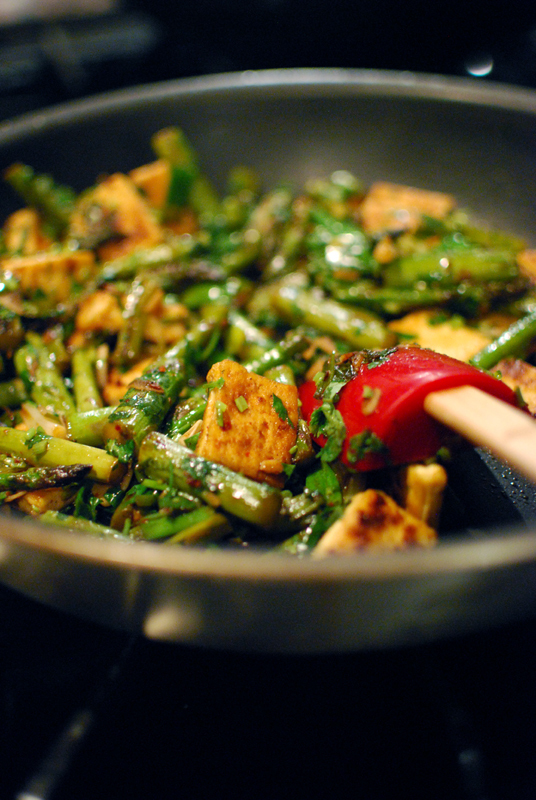 In a wok or large sauté pan, heat 1 tablespoon oil over high or medium-high heat. 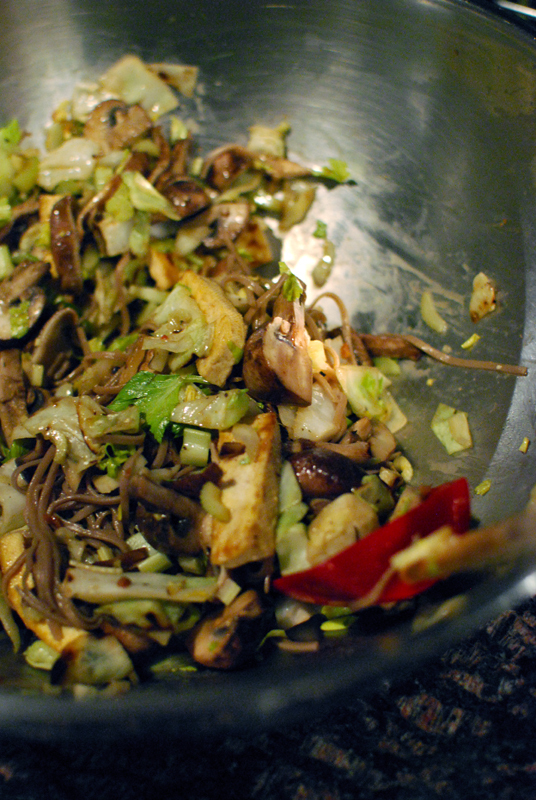 Add the tofu and toss to coat with the oil. Cook until browned, tossing as needed to brown evenly. Add 1 teaspoon fish sauce, stir, and cook just until liquid evaporates. Remove tofu from pan and set aside. 3. Heat another tablespoon oil in the same pan. 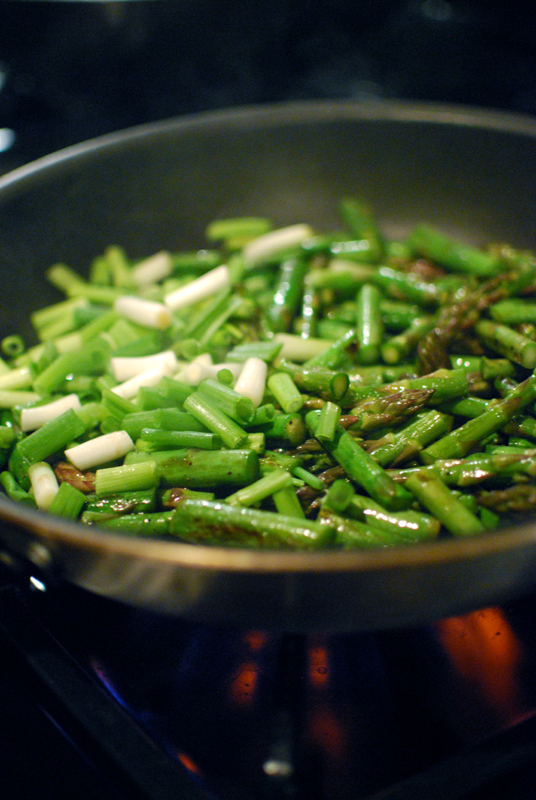 Add the asparagus, toss, and cook undisturbed until beginning to brown. Toss in the scallion whites, and continue cooking until vegetables are softened and lightly charred. 4. Remove pan from the heat, add garlic, gochugaru, remaining teaspoon fish sauce, and a splash of sherry vinegar. The residual heat should be enough to lightly cook the garlic and reduce the liquid. 5. 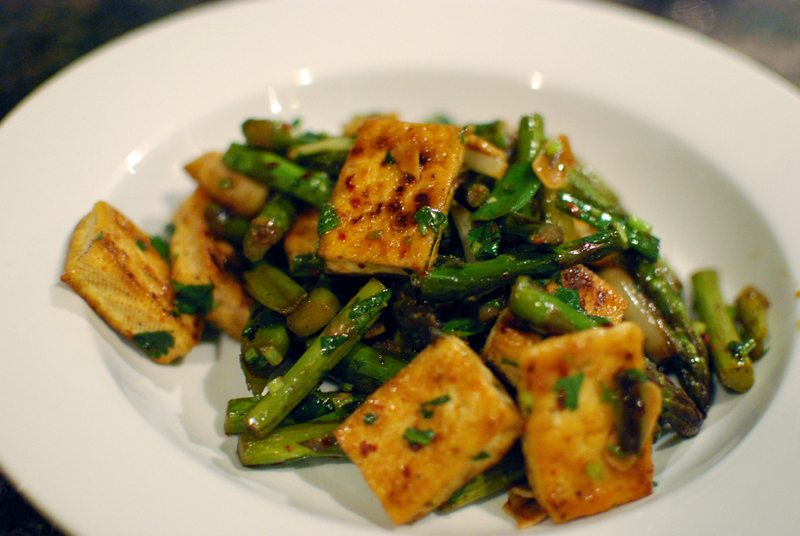 Add the tofu, cilantro, scallion greens, and a generous squeeze of lime juice. Taste, and correct the seasoning with additional lime juice, vinegar, gochugaru, salt, and/or pepper as needed. It should taste a little earthy, but with a bright acidity and spice. 6. Serve at once, with extra lime wedges if you like. 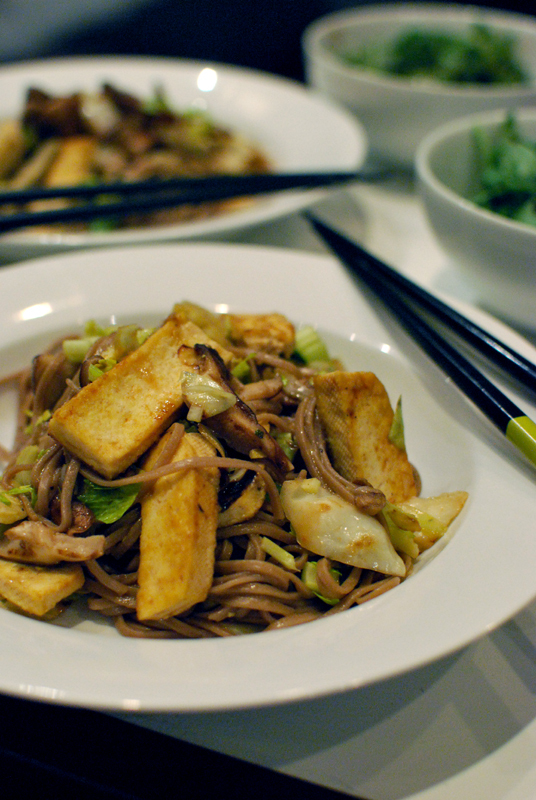 Five Minute Photo Shoot: Tofu, Soba, Shiitake, and Celery. I Think. This was originally intended to be a proper post, with a recipe and errything. But turns out I don’t remember what the hell I put in this dish. 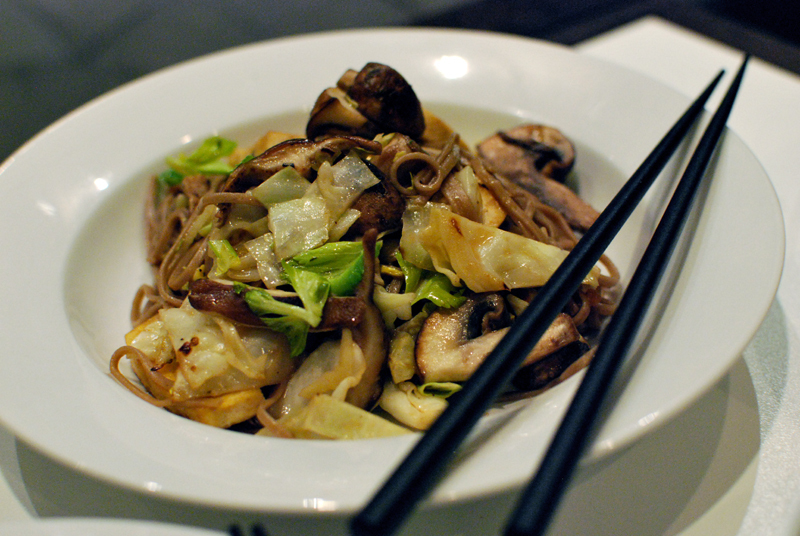 It’s clear there’s tofu, shiitake mushrooms, celery, and soba noodles. Kinda looks like cabbage too. Probably sesame oil and fish sauce. Other than that, I haven’t a clue, and I didn’t write it down because of course I didn’t. I do remember that everything was mised before starting to cook, then each was quickly sautéed one item at a time (maybe in the wok, even), and dumped into a big ol’ bowl before getting tossed together. It was quite good, for what it’s worth. Have fun reverse-engineering. Posted on April 10, 2013 April 10, 2013 Categories Five Minute Photo ShootTags celery, five minute photo shoot, shiitake, soba, tofu1 Comment on Five Minute Photo Shoot: Tofu, Soba, Shiitake, and Celery. I Think. 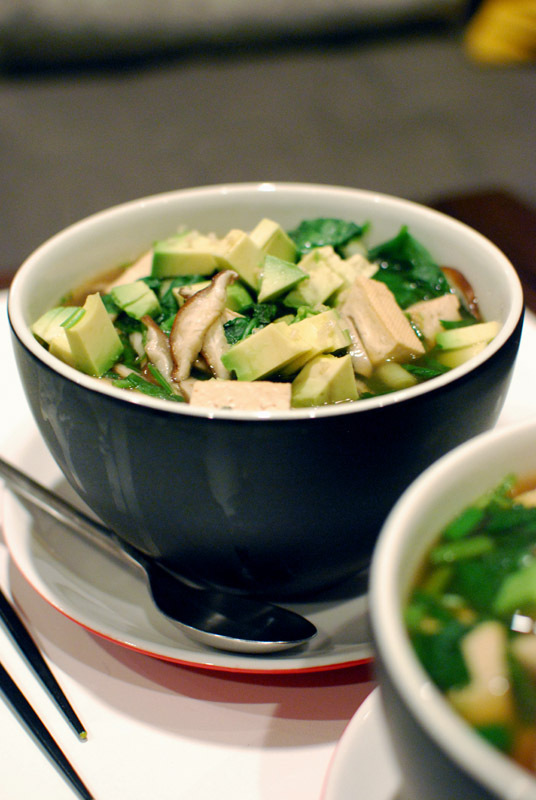 For a recent dinner: an ersatz pho, mostly following this recipe, using a boatload of shiitake, some soy-marinated tofu, spinach, and soba noodles on the bottom of the bowl. Avocado garnish because avocado is mandatory. 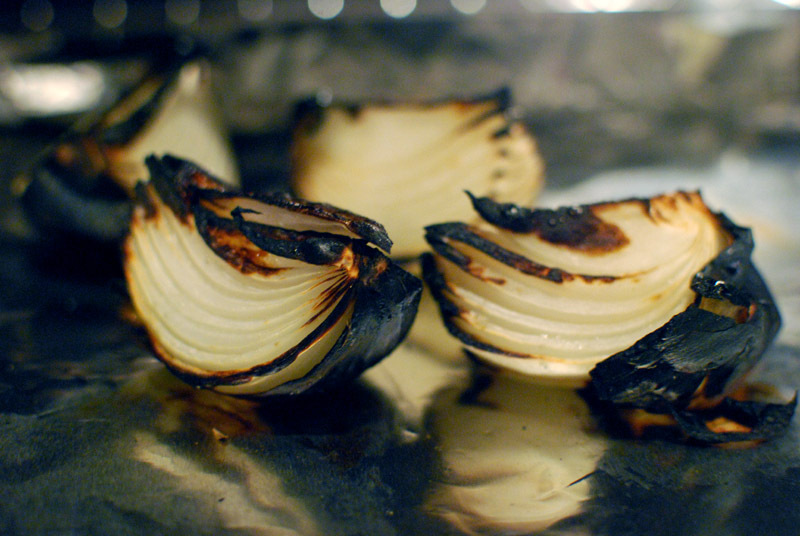 I used some broiler-charred onions to make the stock, which was a lovely touch.